Trump tells OPEC to lower oil prices – Royal Times of Nigeria. President Donald Trump on Thursday issued a fresh call on the OPEC oil cartel to lower crude prices, saying the United States was providing Middle Eastern energy giants with security. “We protect the countries of the Middle East, they would not be safe for very long without us, and yet they continue to push for higher and higher oil prices!” he tweeted. “We will rememver, the OPEC monopoly must get prices down now’. 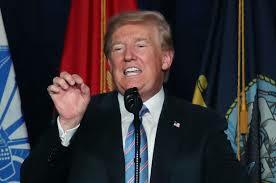 Trump has earlier called for members of the Organization of the Petroleum Exporting Countries — primarily cartel kingpin and US ally Saudi Arabia — to raise their production, and warned importers to stop buying oil from Iran or face US sanctions. Two of OPEC’s founding members, Iran and Venezuela, are under sanctions from Washington. A new set of US sanctions is due to hit the Islamic republic’s oil industry on November 4. Output from Iran has hit its lowest level since July 2016, according to the International Energy Agency, as top buyers India and China have distanced themselves from Tehran.